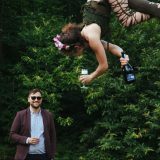 I offer a wide range of AERIAL and FIRE performance as a perfect accompaniment to your party or event. My Aerial Hoop, Silks, Rope and Fire shows can be booked as a themed act or as a hangabout/meet&greet performance tailored to suit your specific requirements. I also offer to create a customised performance to suit your particular circumstances at no extra cost. Please just ask! Get in touch to tell me about what you have in mind and I will do my best to accommodate it. …and any special occasion needing that extra wow factor! Add a touch of class and beauty with a stunning circus act performed on aerial silks. A visually captivating act performed on a suspended metal ring. 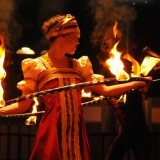 All the primal beauty and danger of fire combined in an enthralling fire show. Aerial bartending is the ultimate drinks pouring experience! Expect your glass to be filled by an aerialist dangling upside down from a hoop. A breathtaking display of drops and mesmerising shapes performed on a vertical rope. I would highly recommend Ana for both teaching and performance work. Having booked her for performances, workshops, class cover and more over the last four years, she is a true professional, has extensive knowledge of a range of aerial arts and incredible performances skills, she would be an asset to any event.